Queen Victoria to the King of the Belgians. Windsor Castle, 4th June 1844. My beloved Uncle,—I gave Louise a long and detailed description of the Emperor*, etc. The papers are full of the details. A great event and a great compliment his visit certainly is, and the people here are extremely flattered at it. He is certainly a very striking man; still very handsome; his profile is beautiful, and his manners most dignified and graceful; extremely civil—quite alarmingly so, as he is so full of attentions and politesses. But the expression of the eyes is formidable, and unlike anything I ever saw before. He gives me and Albert the impression of a man who is not happy, and on whom the weight of his immense power and position weighs heavily and painfully; he seldom smiles, and when he does the expression is not a happy one. He is very easy to get on with. Really, it seems like a dream when I think that we breakfast and walk out with this greatest of all earthly Potentates as quietly as if we walked, etc., with Charles or any one. We took him, with the dear good King of Saxony**, who is a great contrast to the Czar (and with whom I am quite at my ease), to Adelaide Cottage after breakfast. The grass here is just as if it had been burned with fire. How many different Princes have we not gone the same round with!! The children are much admired by the Sovereigns—(how grand this sounds!) —and Alice allowed the Emperor to take her in his arms, and kissed him de son propre accord. We are always so thankful that they are not shy. Both the Emperor and the King are quite enchanted with Windsor. The Emperor said very poliment: “C’est digne de vous, Madame.” I must say the Waterloo Room lit up with that entire service of gold looks splendid; and the Reception Room, beautiful to sit in afterwards. The Emperor praised my Angel very much, saying: “C’est impossible de voir un plus joli garçon; il a l’air si noble et si bon”; which I must say is very true. The Emperor amused the King and me by saying he was so embarrassé when people were presented to him, and that he felt so “gauche” en frac, which certainly he is quite unaccustomed to wear. If we can do anything to get him to do what is right by you, we shall be most happy, and Peel and Aberdeen are very anxious for it. I believe he leaves on Sunday again. To-morrow there is to be a great review, and on Thursday I shall probably go with them to the races; they are gone there with Albert to-day, but I have remained at home. I think it is time to conclude my long letter. If the French are angry at this visit, let their dear King and their Princes come; they will be sure of a truly affectionate reception on our part. The one which Emperor Nicholas has received is cordial and civil, mais ne vient pas du cœur. 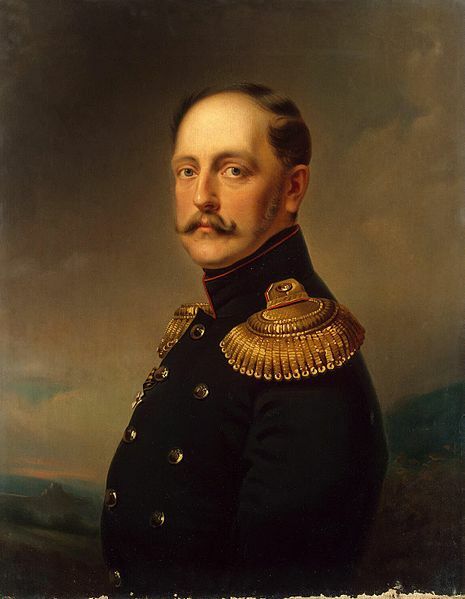 *The Emperor Nicholas of Russia had just arrived on a visit to England.